If your screenplay can’t break into Hollywood, don’t just put it on the shelf. Take a trip on Craigslist or Kijiji to meet more approachable producers. Writers are often passionate about their writing, but clueless as to what to do once they have written their manuscript. 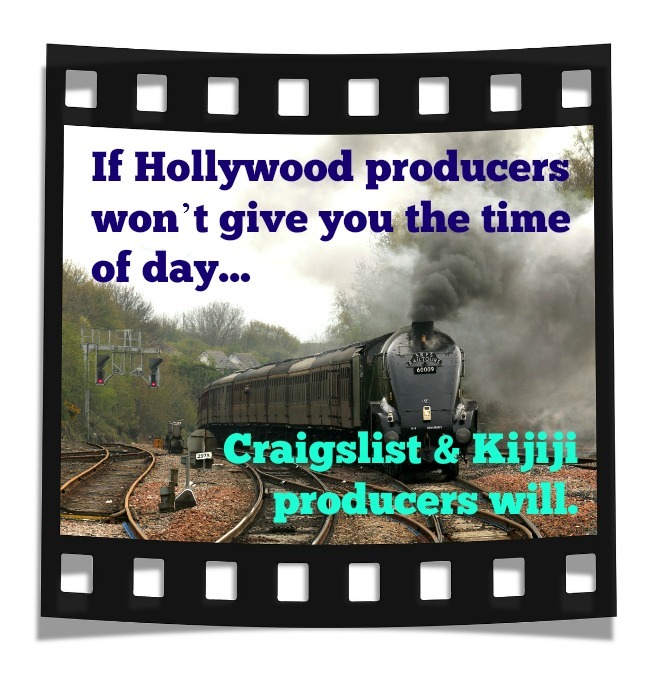 If your manuscript is a screenplay, why not head over to Craigslist (or Kijiji in Canada) to find someone interested in producing your screenplay? If this seems a little unorthodox (or did the word “creepy” come to mind? ), please follow my three trains of thought. You see, there are three ways of using Craigslist to pitch your screenplay. The first way is the boring, ho-hum approach. You can post an ad, because that’s what Craigslist is there for, right? You can sit around by the telephone, just like The Girl From Yesterday (The Eagles, 1994) and hope that a producer notices your ad. OK, why not? Seriously, why not? It takes just a few minutes to compose the right ad and post it. Do you have anything to lose? That’s right. I’ll just wait here while you post your ad. Ooh, that was a flock of geese overhead. I think the grass will need mowing soon. We are a small group producers, financiers and distributors looking to bring your independent film to life. We’re actively looking to acquire/buy feature length screenplays of all genres so please contact us for more details and we’ll send you further information. Why choose [name suppressed] over other similar sites? You are an industry proffesional. Your time is limited. So at [name suppressed] we make finding your next project/screenwriter easy. You no longer have to fill out lengthy forms. No longer do you have to create accounts and log onto 3rd party sites just to view submissions. At [name suppressed], all pitches/applications are sent directly to your e-mail, directly from the writer. IT’S FREE TO POST! Yes, that’s the best I could find in Los Angeles, because everybody hits on Hollywood. But in Atlanta and Seattle and Toronto and Vancouver – there are independent film companies in most major markets, and nobody hits them up. So occasionally they have to go fishing. I’m a producer looking for a film crew. I need the following positions listed below to be filled as soon as possible. I’m looking for some crew members for an upcoming project that I will be shooting in November. The actual shoot dates are November 6th – 9th in the Cleveland area. Hello we are looking for a camera guy, light guy, and a sound guy. This is a sweet comedy, short 20min film. So what? All these guys already have a script. Ah, true…but do they have their next script? What happens when this film is done and they need a new project to work on? There is no harm in approaching them now about their next project. Some of these producers are actually quite experienced and make a living as producers. Others are hobbyists, seeking actors and film crew who will work for free. It’s up to you to decide whom to approach. If this is your first screenplay, you might be happy to take a test run with a hobbyist. Or you might not be. It’s all up to you. It’s amazing how much of the entertainment world does business on Craigslist and Kijiji. If you are writing screenplays, you should be there, too. If Hollywood producers won’t give you the time of day, this is a great way to meet producers who will. Interesting bits on selling screenplay on Craigslist. The truth is that many are not aware of the potential of this online marketplace. Personally, I am also surprised that screenplays and similar items can be marketed on this platform. Thanks for the insight! By the way, I love the “fishing” analogies used to highlight the points made! I also left this comment in kingged.com where I found this awesome post! This classified advertisements website called Craiglist is also a great place to advertise and sell your products. David, the three ways you revealed here gave readers a hope. I am certain that not all are familiar with Craiglist, therefore, this showed them an idea, a new scheme that perhaps would help them make a sale. Thanks for this; sincerely, I had read only few topics about Craiglist, thus this also gave me a further idea. i like this site, i am also a screenplay writer looking for independent film makers to work with.